The faculty counsel for this meeting will be Sangeetha Madhavan. A light lunch will be provided which I'm sure we will all need by the 3rd Friday of the semester and a week before PAA submissions! Several people from multiple departments have already expressed interest and we are excited at making this an interdisciplinary gathering. The journal article is attached and while we only are formally discussing this particular article, we also encourage you to bring in "developed" context perspectives on locational disparities in health outcomes (i.e. low income neighborhoods vs. high income neighborhoods in the US, urban vs. rural comparisons, etc.). 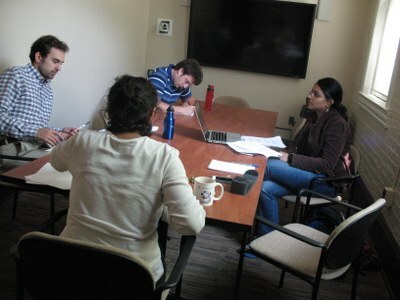 Kriti and Tyler are reviewing some related articles to facilitate this discussion as well. Aside from the article and related research, we also want to discuss why this article was selected by the editor of Demography, what makes for good population research, and how this venue differs from other top population journals. This will be a lot of fun and a great experience for all who come. Please let Kriti Vikram or Tyler Myroniuk know if you are attending (or you can also reply to the reflector). We look forward to seeing you there! The first meeting of the MPRC Journal Club went very well as we had representation from individuals in Sociology, Criminology, Anthropology, and African American Studies departments. During the two hour discussion, we evaluated the strengths and weaknesses of the selected article concerning "slum" residence and childhood health outcomes in developing countries. Most specifically, we had a spirited debate about measuring and defining "slums", how to account for neighborhood/contextual effects more rigorously in this type of research, and the implications that this line of research has on policy formation. Additionally, we speculated why we thought the article was published in Demography and who the individuals were that anonymously reviewed the manuscript, as well as contemplating how one could publish an article building upon this one. The next meeting will be on Friday, October 17 and we will be sending out reminder e-mails with the selected article(s) closer to the date. We want to expand the interdisciplinary nature of this event and encourage students and faculty from the departments listed above and others to join us next month. We are looking forward to another passionate discussion on a Friday afternoon!